A DAY WELL SPENT IN GILI MENO involves doing very little. Such as reading all afternoon under the shade of a cabana by the sea, and perhaps a spot of snorkelling in the mid afternoon. Although at some point during this gloriously relaxing beach holiday, you might get the urge to get out and explore the island. The sunset hours are perfect for this. Once the sun begins to creep lower into the sky at around 5.30pm, balmy ocean breezes sweep gently over the land. It’s time to put on a cool linen shirt and find a neat spot to reflect. 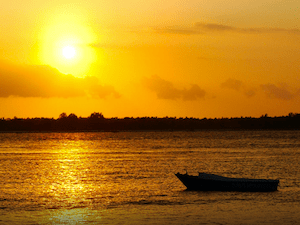 The best sunset bars in Gili Meno are on the northwest of the island, where the vistas skim the tip of Gili Trawangan and out to the watery horizon. These are not the fanciest, just the best spots in Gili Meno, where you can enjoy a sublime sunset tipple. Sunset Gecko is a no-frills bar, restaurant and bungalow plonked right on the door step of one of the best quality snorkelling beaches in Gili Meno. So you can imagine, there’s no need to disrupt what is already a perfect environment in order to create a paradise-like atmosphere. A sun-bleached cluster of gazebos, loungers and dining tables are placed casually on the beach. Sit back, relax, and enjoy the view. And if you start to get a little peckish, the tuna steaks and burgers are highly recommended. Webe Cafe & Bar serves a selection of seafood BBQ, pasta, burgers, beer and cocktails. It’s a great spot to park up for the night and perhaps mingle with the other visitors on the island. The staff are superbly friendly and service is reliable, even though it may run on island time. It’s located right next to Divine Divers and also offers accommodation (which you won’t be able to find and book online). Ryan’s Cafe is located a little to the northeast of the island, but we had to include it in this list. It’s been voted as one of the best cafes in Gili Meno. But it’s not the views, which although stunning, is what visitors rave about. Nope, it’s all about the garlic butter sauce grilled chicken here and lemon honey juice. Which makes this spot more for the foodies on the island looking for a place to satisfy a hunger craving, and stay away from those tempting ice cold Bintangs. Well, if the last three spots we recommended didn’t do it for you, then Diana Cafe certainly will (baring the last fancy fancy schmancy listing). 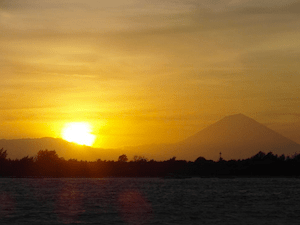 With the perfect view of the sunsetting over Gili Trawangan’s hilly peak, it’s known to be one of the most romantic spot in Gili Meno and hence, draws the couples and honeymooners of the island. Not ideal if you’re travelling solo and don’t wish to be reminded of the ex..
Last but not least, Gili Meno’s newest and poshest boutique resort, Mahamaya, promises the most romantic tables in Gili Meno, set on the waters edge with The best sunset view on the island. They aren’t kidding. And if it’s an extra special occasion, they’ll decorate the sand beneath your feet with flower petals. 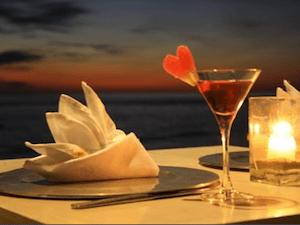 On the other hand, a white linen table and full service dinner might not be on the top of your list of things to do in paradise. However getting through their interesting cocktail menu at the bar is not a bad way to spend an evening in Gili Meno. Whether you’re travelling with a loved one, or on your own.